The HMCS Vancouver became the first combat surface ship of the Royal Canadian Navy to fire a Harpoon Block II missile against a ground target. The launch took place at a United States Navy firing range, during a Joint Littoral Training Exercise (JoLTEX) between the two navies. HMCS Vancouver is a Halifax-class frigate with a displacement of 4,795 tonnes. It was commissioned in 1993. As with the rest of this class of frigates, it was designed as a general-purpose vessel with increased ASW capabilities. In 2013, it went through an 18-month Mid-Life Upgrade. The programme included the integration of a new combat management system, radars (primary and secondary), communications suite, electronic warfare system and of a long-range IRST. 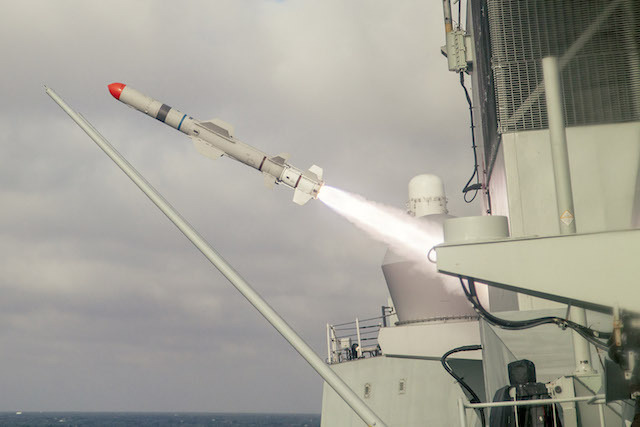 The MLU allowed the Canadian Navy to make the necessary changes in the combat management system, so as to configure the Harpoon missile to engage ground targets. Such an innovation allows the development of a joint tactical doctrine, according to Commander Clive Butler. The engagement of ground targets with a missile system would offer Special Forces to guide modern naval weapons against high-value enemy assets.